I picked up Uncanny X-Force #1 because I felt like I knew the characters involved, but I quickly found out I have know idea who the white ski-mask guy who talks to some bio-tech weapon thingy is. Oh, and what's with the bio-tech thingy? Nevermind. Scratch that last thought. It doesn't matter because the tag-team of Rick Remender and Jerome Opena work better together than the Bushwhackers. Bringing their Fear Agent and Punisher experience to the newest Uncanny X-Force title, the two have set the stage for an interesting story involving the first mutant, the insane mercenary mutant, the old adamantium man mutant, the purple hand-dagger mutant, the first mutant's horsie-man and a guy in a white ski-mask...we'll call him Carl. Mysterious Carl. Jerome Opena's art is a particular highlight in the comic of the day. The way he details his character's costumes down to the seams on Wolverine's, Deadpool's and Carl's uniforms is appreciated because every little extra detail adds to the engrossing experience. 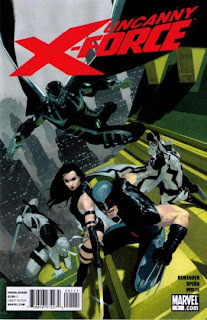 The reveal at the end of the issue has me interested, once again, in the X universe, which is a very dangerous universe to get interested in because when you get interested in one X-book that often leads to collecting many X titles. At one point there is going to be a crossover, and I will buy the other X titled comics involved, and I will be very disappointed, and I will stop reading X-books, and I will miss-out when they introduce characters like Carl, and then eventually buy a new X title and say...who the heck is the guy in the white ski-mask?